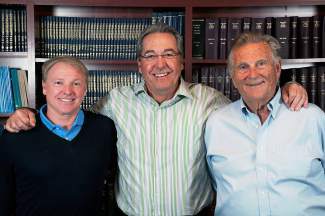 (Left to right) Dr. Marc Philoppon, Gary Peterson and Dr. Richard Steadman. Peterson, a respected leader in both the medical device and health services fields, will direct operations at The Steadman Clinic and Steadman Philippon Research Institute as CEO. VAIL — Gary A. Peterson, a veteran of more than 40 years in the medical device, health services and finance industries, has been named chief executive officer of both The Steadman Clinic and the Steadman Philippon Research Institute, effective immediately. The announcement was made Monday by Dr. Marc Philippon, managing director of The Steadman Clinic and co-chairman of the Steadman Philippon Research Institute. Peterson replaces former CEO Tom Mars, who left the post just three months after he came on board in October. He cited governance issues related to the subsequent decision of one of the founding doctors to end his surgery practice, according to an article by Bloomberg news. Steadman Clinic and Research Institute officials did not comment on Mars’ departure. Peterson, 62, brings a wealth of experience in medical and healthcare leadership to The Steadman Clinic and the Steadman Philippon Research Institute. Since 1986, he has directed the business operations of numerous medical device and healthcare consulting companies around the United States. Most recently, Peterson has served as the managing member of Baton Capital LLC, a group of healthcare and financial experts with over $1 billion in loan capability for medical equipment leasing and financial solutions for hospitals, physicians and medical equipment manufacturers. In 1983, Peterson co-founded Angiomedics Inc., an angiographic catheter company that also became a pioneering company in angioplasty and stent technologies. After taking the company public in 1984, Peterson helped establish a strong product supply agreement with Pfizer, Inc., which led to Pfizer acquiring Angiomedics in 1986. Peterson began his career by successfully maneuvering through the growing medical device field in the sales, management, design and development of products related to kidney dialysis, cardiac pacemakers and interventional cardiology and radiology. Peterson graduated with a bachelor’s degree in biology and distributive sciences from Gustavus Adolphus College in St. Peter, Minnesota, in 1973. He completed the Executive Marketing Management Program at Columbia University in New York in 1980.